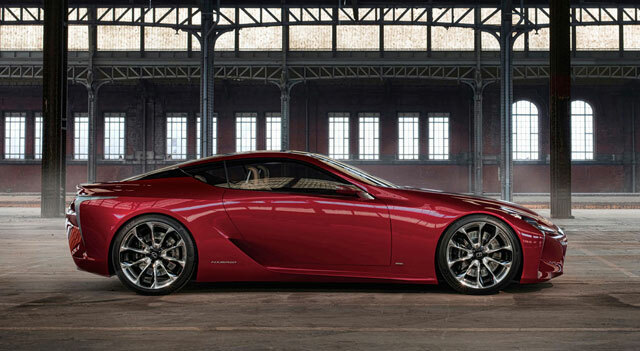 Lexus to Build a Twin-Turbo 600-Horsepower LF-LC Coupe? Word on the Tokyo street is that there’s a Lexus LF-LC Coupe mule running around Japan packing a 600-hp twin-turbo version of the upcoming RC F’s 5.0-liter V-8. That power rating may be on the conservative side. There still isn’t much [information], but our sources confirm the monstrous twin-turbo V-8 will be the SC F. There’s a potent hybrid LF-LC/SC H whose powertrain will probably be the fruits of the BMW joint project and make around 500 hp. There will be a third engine, a base naturally aspirated V-8, that will produce a bit less power than the hybrid (450 hp) but get worse fuel economy. That’s a narrow horsepower spread for a single car — while I hope that every detail is true, it’s a bit of a stretch considering only one of these engines is currently in production (the naturally aspirated V8 would be the RC F engine) and all are extremely high-performance. Also, is there no plan to offer the next-generation SC with a V6 engine? Really though, let’s focus on the big news — how about this twin-turbo SC F with 600+ hp? It just so happens that Toyota Motorsports in Germany has already built a twin-turbo 5.0L V8 engine and installed it in an LS — the final numbers were more than 640 horsepower and a top speed of 200mph. Matches up well with the rumor and seems like a strong possibility.